There's big news coming out of Garmin Towers - the GPS specialist has unleashed its first ever heart rate monitoring running watch: the Garmin Forerunner 225. Looking a lot like the Forerunner 220, the 225 packs in an optical heart rate monitor, made by the bpm experts at Mio. This is the same Mio heart rate technology that you'll find in the likes of the Mio Fuse and the Mio Alpha 2, as well as the Adidas miCoach Smart Run and the TomTom Runner Cardio. Up until now, people wanting to train within heart rate zones with a Garmin running watch had to rely on an additional chest strap. And while some people argue that a dedicated chest-strap is the only accurate way of measuring bpm, Mio says otherwise. Back in March, the company's CEO Liz Dickinson told Wareable that the Mio sensor was the only truly accurate wrist-based monitor on the market - dismissing the likes of Fitbit and its PurePulse tech and even dismissing any claims the Apple Watch has in the area. 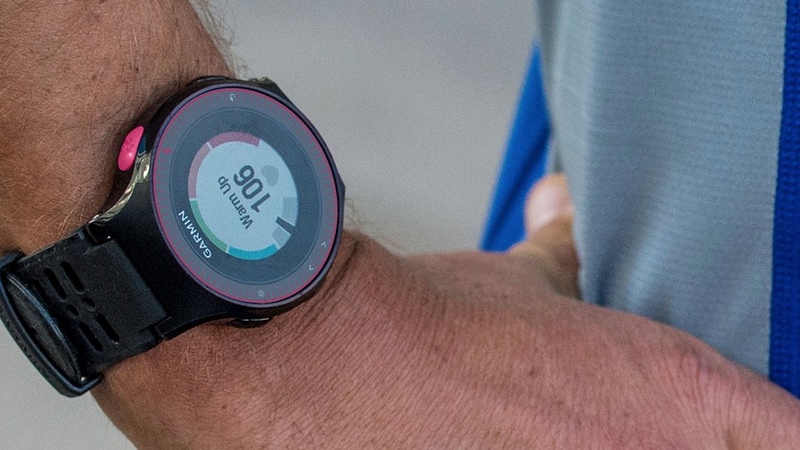 "After more than 10 years of developing GPS running watches we are very excited to team up with Mio to introduce our first device featuring wrist-based heart rate," said Dan Bartel, Garmin vice president of worldwide sales. "Getting and understanding your heart rate is more comfortable and easier than ever with the Forerunner 225's real time results on a colourful gauge – allowing runners to evaluate and adjust effort quickly so they can focus on their run." On the Forerunner 225 you'll get access to bpm training zones displayed on the colour, 180 x 180, 1-inch screen. The watch sets your regular hear rate zone using a formula based on your age (you can tweak this in the app) and then you train within different zones depending on your workout plan: grey for warming up (50% of your maximum heart rate), blue for the easy zone (60% of your max), green for aerobic (70%), orange for threshold (80%) and red for your maximum zone (90%+). The Forerunner 225 packs a built-in accelerometer as well as GPS so you can log your miles outdoors and inside on the treadmill and, using Garmin Connect, you'll be able to access a wealth of data including pace, distance, cadence, calories and more. The Garmin Forerunner 225 is landing in June and will cost $299.99. It's red and black, has a 5ATM water resistant rating and will last for between 7 and 10 hours in GPS mode (4 weeks in standby). We'll be bringing you a full review ASAP, so be sure to check back.